If you subscribe to the notion that politicians are playing in a house of cards, then the current American election cycle could perhaps best be described as a few cards short of a full deck. Luckily, there is one person who knows when to hold 'em and know when to fold 'em. Yes, folks, that person is Hillary Rodham Clinton. With over forty years on the frontlines of advocacy for women, families, and the United States in general, the former First Lady and Secretary of State has more political experience and finesse than anyone can reasonably shake a stick at. Detractors say she's untrustworthy and unlikeable but her supporters mandate she is the smartest and most genuinely empathetic person in any given room. Who should you believe? 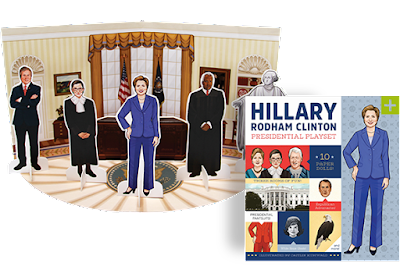 With the Hillary Rodham Clinton Presidential Playset, you get to make your own decisions based on your personal beliefs, values, and present needs. Just like all Americans should be able to! 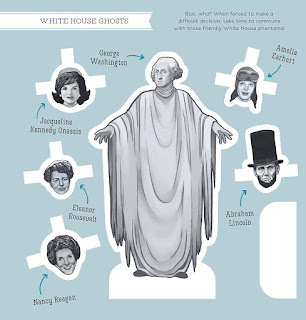 Change your pantsuit to fit your mood, confer with Bill or the Supreme(Court Justice)s, engage in meaningful debate with a host of Republican adversaries, share knowing looks with Oprah, and talk shop with ghosts from the White House past. There's even a Primary bonus expansion pack to download, featuring Donald Trump and Bernie Sanders paper dolls. Imagine the fun you'll have watching debates and commentary with all the players literally in the palm of your hand! Disclaimer: Thanks to the fine folks at Quirk Books for sending me this timely and relevant piece of pop culture ephemera to review. If you click through and buy a copy for yourself, I might earn a penny or two.